I’m back with our last 2011 Year In Review link party, and this time it’s all about Room Makeovers! I only completed two room makeovers this year, but each of them were filled with DIY projects. Here’s a look back at those room makeovers. So were you able to finish any room makeovers this year? If so, I want to see them! Feel free to link up any and all room makeovers that you finished in 2011. 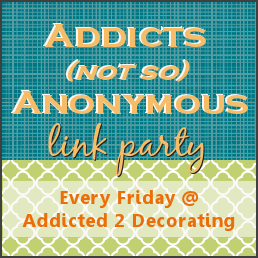 And don’t miss the other two 2011 Year In Review Link Parties! All three link parties will be open through December 31st. Next Post Watch Out! It's Getting Personal In Here! Those makeovers are amazing!!! I especially loved the kitchen. Wow! 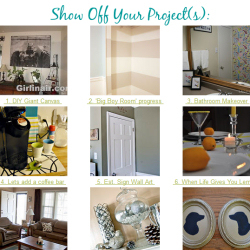 I linked up a post that had some room makeovers and a few other projects. Hope that was okay. Happy New Year! Love that white kitchen transformation! Hope you have a fabulous New Year! LOVE that family room!!! Can you please come do my house next? Thanks so much for hosting!! I linked up a few projects today 🙂 stop by and say hello sometime! i SO love the tv wall. great inspiration! The kitchen renovation is fantastic! The whole area looks so open and well lighted. Congats on a job well done. I hope John and Alice realize how beautiful their kitchen is. I just had to link up my kitchen makeover! Thanks for hosting!! What I love is the big change that you made in John & Alice’s family room. It became more lighter, comfortable, and relaxing place. Our bungalow house is quite small with two bedrooms and a living room and kitchen together. I’m having a hard time decorating and arranging it, how can I make it look bigger? Please help me.